All patterns copyright Julie Theaker, not for commercial use. Note: I did not allow for selvedge stitches when knitting this, so when a row begins with K2tog, I knit the first and second stitches together. When there was no other action on the first stitch (for a regular knit row), I did slip the stitch. DIRECTIONS: Cast on 54 stitches. Knit one row plain. For the next, lace row, *(K 2 tog) 3 times, (yo, k1) 6 times, (K 2 tog) 3 times* Repeat from first *. There will be three repetitions, total. Work four-row pattern (with just one row of lace and three rows of plain knitting) until you run out of yarn. End on a plain-knit rown, then bind off. BLOCKING: There are many fancy ways to do this, but I simply soaked the scarf in a sink full of room-temperature water with some Eucalan, then let it drain on a towel for a few minutes, pinned it out, and let it dry. 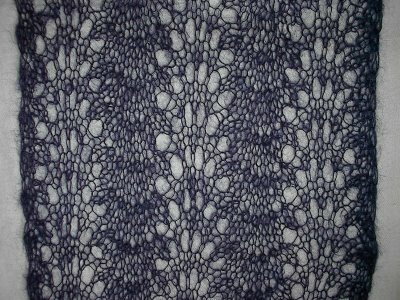 This lace pattern is a modified version of Feather-and-Fan stitch, from "A Treasury of Knitting Patterns" by Barbara G Walker. This is gorgeous! Thanks for sharing, I'm definitely casting on today!! 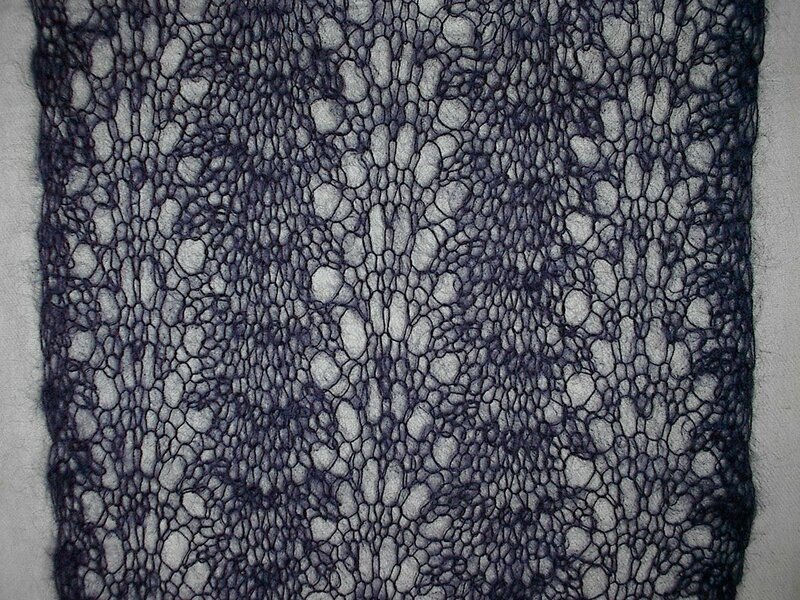 After the lace row, do I knit 3 rows just knit (so the scarf will show purl on 2 of these rows)? Your instructions read "plain knit"
so I am assuming I never purl? I am using needle size 9 , is that OK? Hi from New Zealand. Lovely pattern. I am a first time knitter. Could you describe the type of yarn over please. Is it just bringing the yarn over and forward? I see in the internet there are a few types. I'm currently a stay at home mother, freelance writing on my off time, wondering how I became part of the ten thousand year old tradition of raising the kids while creating textiles. I grew up in NE Ohio dairy country, married a sailor, lived in Hawaii ten years, lived in SC for five years, then moved back to culture shock and confusion. Nothing but good times ahead.